If you’ve got a netbook with really great battery life, you’ll probably still have loads of time left even with only 10% of the battery remaining. Here’s how to tweak the settings so it alerts you or goes into sleep mode at a more reasonable time. Note: obviously if you don’t have a great battery in your laptop, you should probably be careful with these settings or you might lose data. If anything, you’d be better off making the notifications happen sooner in that case. You’ll want to start by heading into Power Options from the Control Panel, or more easily, by just clicking on the power icon in the tray and going to More Power Options. 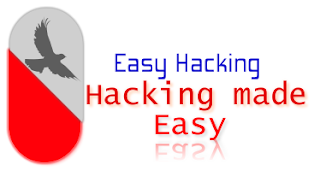 Once you’re there, you can tweak the current plan by clicking the “Change plan settings” link. Low Battery is the first notification you’ll get, generally at 10% battery life remaining. At this point you’ll get a notification unless you feel like turning it off. 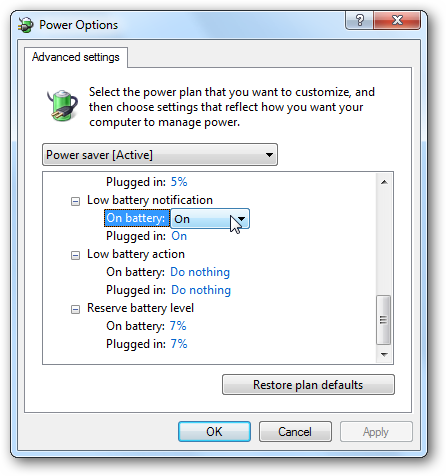 You can change the Low Battery Action to go into sleep mode if you want, though that would defeat our purpose here. 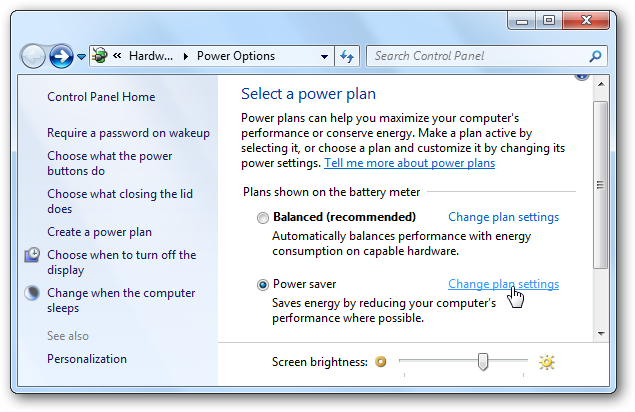 Reserve Battery is when the laptop will start taking drastic measures to stop using extra power, usually at 7%. 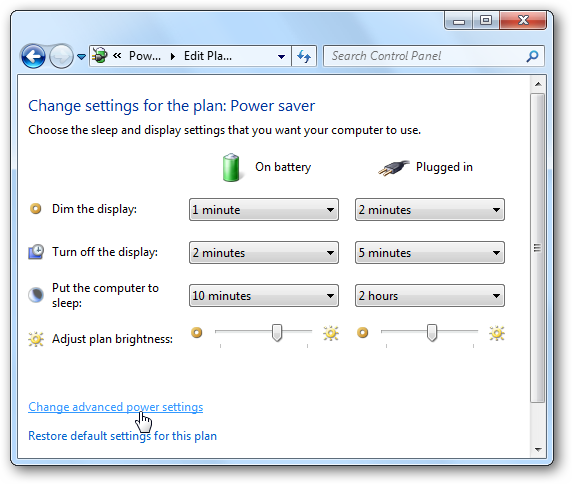 Critical Battery is when your laptop will immediately go into Hibernate mode, usually at 5% remaining. 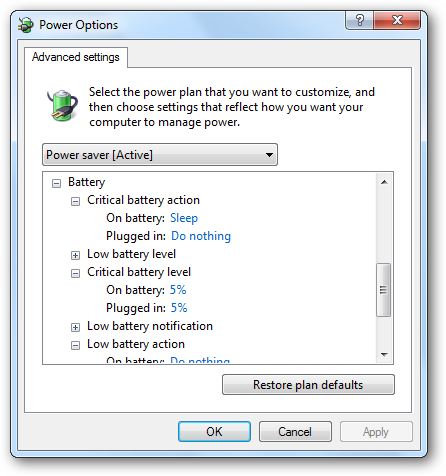 You can change the Critical Battery Action to Sleep instead of Hibernate if you choose. You can customize any of the levels here, and you can even disable the notification entirely if you want. Many MacBook Air users with Windows 7 running, have adjusted the Critical Battery Action to Sleep Mode instead, and changed the low battery notification down a bit. That’s mostly because MacBook have got great battery life, and they always plug it in quickly once the battery dies.